Just go ahead and make your selections from the drop down tabs here and when you are done you will have built your own custom complete! We even put it togther for you at no additional charge if you like. Choose your mounting hardware: BeerNutz Mounting hardware (Phillips head) 7/8" BeerNutz Mounting hardware (hex head) 7/8" BeerNutz Mounting hardware (hex head) 1" BeerNutz Mounting hardware (hex head) 1.5"
Please choose my trucks, wheels and hardware for me? : No thanks I know what I want yes please Im not sure what to get. A complete deck all ready to go. All you have to do is adjust the trucks to your liking. 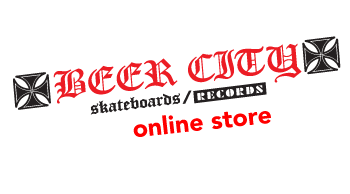 You get your choice of and Beer City or DRI deck; Landshark wheels ,Independent trucks and Beer Nutz Hardware. Lite griptape and ABEC III bearings are also included. If your not sure what trucks, wheels and mounting hardware to pick just choose that option and we can pick for you.